Congratulations to the winners and thank you to everyone who entered. 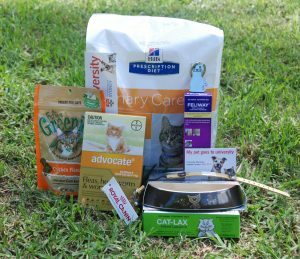 To celebrate the launch of our new website, we have four pet care packs valued at $250 each up for grabs. You can choose whether you would like a dog or a cat pack. To enter simple fill in your details on the website Contact Form including ‘Competition’ in the subject line. Don’t forget to tell us if you would like a dog or a cat pack and include your telephone contact number so we can call you and let you know if you win. Entries close at 12 noon on Monday 27 March. NSW permit number LTPS/17/12354. See terms and conditions below. Entry is open to all residents of NSW excluding employees, immediate family members of employees, employees of any company associated with the promotion. Please note, the prize winner will be required to organise for collection of their prize from Uni Vets Camden, 410 Werombi Road, Brownlow Hill NSW. One entry is permitted per person. The Promotion commences at 5pm on Monday 13 March 2017 and entries close at 12 noon on Monday 27 March 2017. 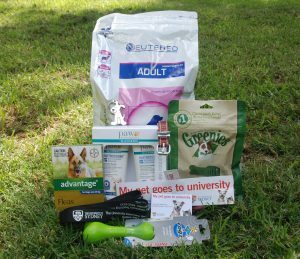 To enter, entrants must visit univetscamden.com.au and fill in their details on the website Contact Form including ‘Competition’ in the subject line, whether they would like a dog or a cat pack and their telephone contact number. The random prize draw will take place at 5pm on Monday 27 March 2017 at 410 Werombi Road, Brownlow Hill. The winners will receive their choice of either a dog care pack including a 3.5kg bag of Royal Canine dog food, three treatment pack of either Advantage flea treatment or Advocate flea treatment, Greenies 43 daily treats pack, Paw by Blackmores shampoo and conditioner pack, Rogz dog bone toy, Royal Canine leather collar, Sydney University dog lead, bumper sticker, key ring and fridge magnet; or a cat care pack including a 2.9kg bag of Hills c/d stress diet cat food, three pack of Advocate flea, heartworm and worming treatment, 60ml Feliway spray, 85g pack of Greenies cat treats, 70g pack of Cat Lax, Rogz cat bowl, Royal Canine leather collar, Sydney University dog lead, bumper sticker, key ring and fridge magnet. The total prize pool value is approximately $1000. Winners will be notified by phone/email within two (2) business days of the draw. If there are any unclaimed or un-awarded prizes a prize draw will be conducted on 30 June 2017 at the same time and place as the original draw. If a winner is drawn they will be contacted by phone and in writing within two (2) business days. Authorised under NSW permit number: NSW permit number LTPS/17/12354.